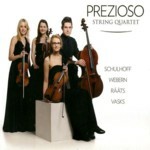 2 Prezioso Quartet (ERP). This quartet’s members are Estonian, and they’ve been together since 2006. This is their first recording, and it makes a big splash, with a vivid acoustic and some surprising repertoire. Webern’s highly uncharacteristic Langsamer Satz and an arrangement of a likeable chamber concerto by Estonian Jaan Rääts are framed by a cheerful dance suite by the not-well-enough-known Erwin Schulhoff and the sublime fourth quartet of Peteris Vasks. 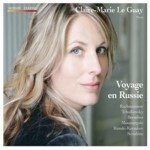 3 Voyage en Russie – Claire-Marie Le Guay (Mirare). Basically, a whole bunch of short Russian piano pieces, with a focus on Rachmaninoff and Scriabin. Some of the “greatest hits” are here, but there’s plenty of unfamiliar music, and it’s all captivating. Claire-Marie Le Guay brings everything together into a convincing program, from the opening Flight of the Bumblebee to the closing Vers la flamme, Scriabin’s astonishing depiction of the heat death of the Earth. 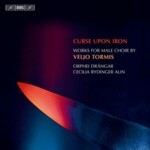 4 Veljo Tormis: Curse upon Iron – Orphei Drangar (BIS). Tormis’s choral music, of which this selection for male voices represents just a small portion, is firmly rooted in the folk music of his native Estonia. Some of it’s heart-achingly beautiful, while other pieces tap into stronger, darker forces, such as the shamanic title work (adapted from the Kalevala, the Finnish epic poem), full of chanting and pounding drums. An exhilarating experience. 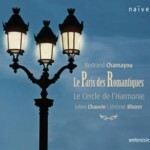 5 Le Paris des Romantiques – Le Cercle de l’Harmonie/ Jérémie Rhorer (Ambroisie). It’s hard to decide what’s the highlight of this imaginary concert from Paris circa 1850, played on period instruments. On the one hand we’ve got the beautifully clear performance of Liszt’s first piano concerto, with Bertrand Chamayou playing an 1837 Érard. On the other, there’s Napoléon Henri Reber’s fourth symphony, which manages the neat trick of coming across like a long-lost Beethoven composition while simultaneously sounding utterly fresh. 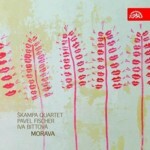 6 Morava – Škampa Quartet (Supraphon). I kind of surprise myself by having a second quartet disc in my top ten. Most of this release is taken up by the three string quartets of Pavel Fischer, all of which are greatly inspired by folk music from Moravia and elsewhere and full of fascinating twists and turns; the most magical moment is in the quartet “Wild Mountain Thyme”, where that Scottish song suddenly emerges at the end of the middle movement. There’s also a quirky quartet from violinist/singer Iva Bittová, who herself sings on a couple of other pieces. 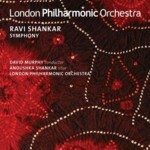 7 Ravi Shankar: Symphony – London Philharmonic/David Murphy (LPO). Shankar’s symphony is indeed a four-movement structure modeled on the traditional classical symphony but employs raga scales and makes considerable use of the sitar, played here by his daughter Anoushka (this is a recording of the work’s premiere in 2010). I know next to nothing about Indian music so all I can report is that this “sounds Indian”, and I guess it’s this aspect of the work that lends it a general post-minimalist feel. 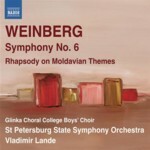 8 Mieczyslaw Weinberg: Symphony no.6 – Vladimir Lande (Naxos). Weinberg’s star continues to rise, though my explorations are at an early stage and I’m still inclined to fall back on the description “sounds quite like Shostakovich, with a bit of Mahler thrown in”. In the Sixth Symphony, the composer’s gift for orchestration is dramatically enhanced by the presence of a boys’ chorus in three of the movements; the music is increasingly troubled but ends with a hopeful lullaby. 9 Elena Papandreou plays Nikita Koshkin (BIS). An intriguing collection of new guitar music from the Russian guitarist/composer, three of the four pieces being written for Papandreou. 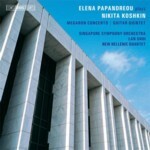 The lengthy Megaron Concerto is a mostly sombre work, though it sports a very catchy second movement. The quintet for guitar and strings is also rather dark-hued; it’s all in a thoroughly accessible idiom but you’ll never mistake it for Boccherini! Overall, an album that patiently creeps up on you. 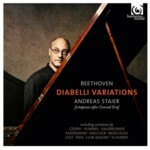 10 Beethoven: Diabelli variations – Andreas Staier (Harmonia Mundi). Beethoven’s epic adventure brought to spectacular life by Staier, who plays a copy of a Beethoven-era Graf fortepiano that comes with some surprising sound-effects features. These provide bonus entertainment but Staier’s playing is, of course, the main event. For good measure we get ten other composers’ contributions to Diabelli’s project; the effort by 13-year-old Franz Liszt is hilariously easy to pick from the line-up. 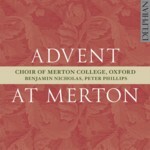 11 Advent at Merton – Choir of Merton College, Oxford (Delphian). I’ll freely admit that English church choirs aren’t usually something I enjoy, so this one came as a surprise. It’s a collection of old and new pieces, including seven antiphons commissioned from the likes of John Tavener, Rihards Dubra, and Gabriel Jackson by Merton College’s chaplain. Old and new combine beautifully in Jan Sandstrom’s hypnotic reworking of Es ist ein Ros entsprungen, but it’s gorgeous music all round. 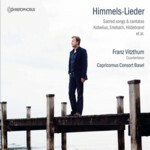 12 Himmelslieder – Franz Vitzthum (Christophorus). An excellent countertenor, in a program of German Baroque cantatas and songs. The collector in me is delighted to add some new composers to the library (Johann Augustin Kobelius and Johann Hildebrand, anyone? ); the music lover is thrilled to hear Franz Vitzthum’s ethereal purity—it floats like no other countertenor I can think of—and the Capricornum Consort Basel’s sympathetic support. 13 Bach guitar transcriptions – Graham Anthony Devine (Naxos). The miracle of Bach’s music is that it can be adapted to pretty much any instrument and still sound wonderful. 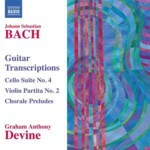 Graham Anthony Devine himself has arranged the fourth cello suite and second violin partita, among other works, and the results seem wholly natural; comparison to the originals is pointless, as this is fine, expressive playing that stands on its own merits. 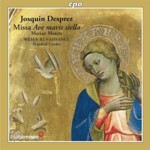 14 Josquin Desprez: Missa Ave maris stella – Weser Renaissance/Manfred Cordes (CPO). My medieval and renaissance listening this year has mostly been confined to older recordings as I slowly work my way through my History of Classical Music. This is a lovely collection, sung by male voices only, of a mass and several motets by – as I’ll hopefully soon get round to describing him – the greatest of the Franco-Flemish composers. 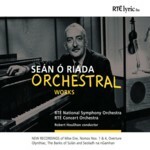 15 Seán Ó Riada: Orchestral works (RTÉ). Seán Ó Riada was an important figure in Irish music who died too young, at age 40 in 1971. 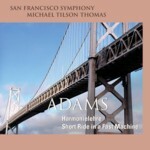 This is a collection of several orchestral works, including his landmark score for the documentary film Mise Éire, making use of various well-known Irish tunes, and the vibrant Hercules Dux Ferrariae, which combines twelve-note rows with a theme by Josquin and no longer sounds like the forbidding piece I thought it was when I first heard it as a teenager. 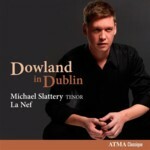 16 Dowland in Dublin – Michael Slattery & La Nef (Atma). This album takes as its starting point the suggestion (not well supported, it must be said) that English Renaissance composer John Dowland was in fact an Irishman. Here, the American tenor Michael Slattery joins forces with Canadian baroque ensemble La Nef to present some of Dowland’s lighter music with a distinctly Celtic flavour. There have been sniffs from some quarters that this isn’t “authentic”, which rather misses the point. 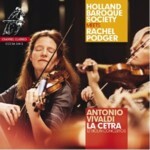 17 Antonio Vivaldi: La Cetra – Rachel Podger & Holland Baroque Society (Channel). These twelve concertos aren’t among Vivaldi’s most popular, but one listen will make you wonder why. Rachel Podger and the Holland Baroque Society are clearly having a ball here, with music full of incident and invention. We all know there’s more to Vivaldi than the Four Seasons, but it’s nice to be vividly reminded. Of the twelve concertos, is there a highlight? Um… all of them? 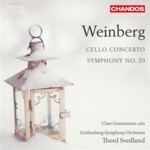 18 Mieczyslaw Weinberg: Symphony no.20; Cello concerto (Chandos). More Weinberg! Thord Svedlund and the Gothenburg Symphony Orchestra’s recording of Weinberg’s Third Symphony was my first introduction to the symphonies and became an instant favourite, and their follow-up is also impressive. The symphony (written in 1988) is a dark work that gradually tightens its grip on the listener, while the cello concerto has a beautiful, lyrical first movement that should be much better known. 19 Fazil Say: Istanbul Symphony (Naive). Fine musical picture-painting from the Turkish pianist/composer. The Istanbul Symphony is, in Say’s words, a picture of “a nostalgic, dreamy, vintage Istanbul” that makes use of Turkish instruments alongside the Western symphony orchestra. Its partner on the disc is the Hezarfen Concerto for ney (a Turkish flute, played by Burcu Karadağ) commemorating the man who is claimed to have glided across the Bosphorus in 1632 using wings of his own construction. 20 Goethe Lieder – Marlis Petersen (Harmonia Mundi). Schubert and Wolf are the obvious choices for a program of Goethe settings, and they’re here, but the particular value of this set comes from the appearance of less-obvious pieces, with composers ranging from Fanny Mendelssohn to Charles Ives to Manfred Trojahn. Multiple versions of “Wanderers Nachtlied” shed light on how different composers deal with the same text. Finally, I must highlight two pieces of music from albums that didn’t make the cut. Pedro Sanjuán was a Basque conductor and composer who spent a decade in Cuba. The slow movement of his orchestral work Castilla is a gorgeous, sinuous piece with a saxophone tune that’s a first cousin of Ravel’s Bolero. The rest of the album from the Basque National Orchestra is fine, but this movement—En la llanura—gets my award for favourite individual track of the year. Meanwhile, the award for best musical depiction of a dog in a spaceship goes to Jon Øivind Ness’s Zvezdochka in Orbit, an alarmingly vivid portrait for cello and wind band of what Yuri Gagarin’s immediate predecessor might have experienced in her capsule. It heads a very varied program played by Ernst Simon Glazer and the Norwegian Navy Band, which includes Friedrich Gulda’s entertainingly daft concerto. Thanks for a great list! So much to check out. I know one thing – the very first album I’ll be investigating is Rachel Podger’s. As an avid baroque music lover, and a big fan of both Vivaldi and Podger, I don’t know how that one slipped past me! And La Nef – and, well, the list goes on…so much to check out. Thanks again. Bravo! Thanks, Kez. I forgot to point out that the Podger now goes down in history as The Last Album I Bought In HMV.